Now let’s see a first solution to solve the problems. 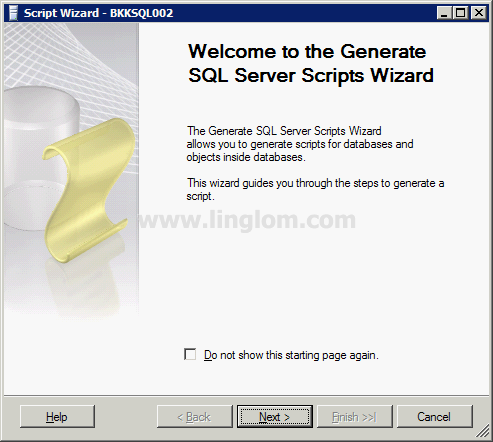 On this post, you see how to backup ‘Northwind’ database by generate a SQL Server script on SQL Server 2008. 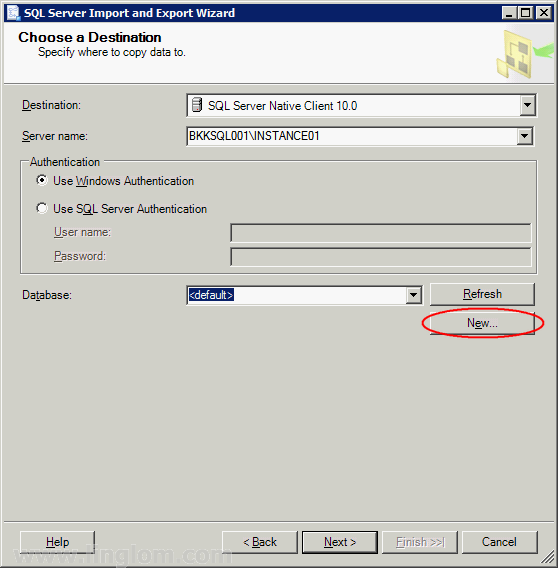 Then, restore the ‘Northwind’ database by execute the SQL Server script on SQL Server 2005. 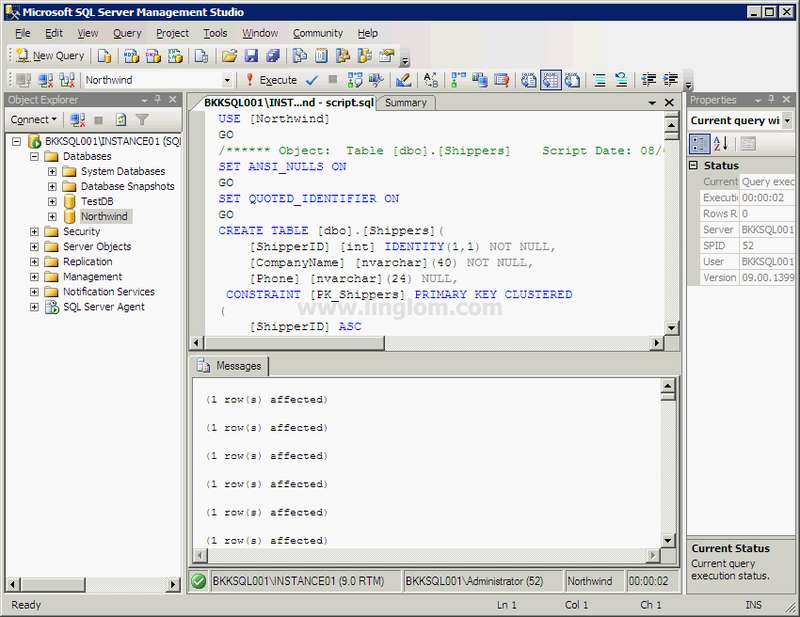 On Microsoft SQL Server Management Studio, connects to the SQL Server 2008. Right-click on the database that you want to backup and select Tasks -> Generate Scripts. 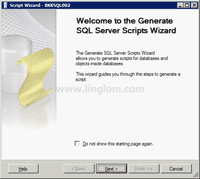 On Welcome to the Generate SQL Server Scripts Wizard, click Next. 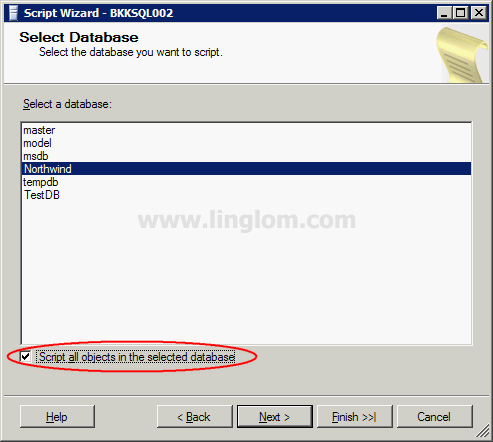 On Select Database, select Northwind and check Script all objects in the selected database. Then, click Next. 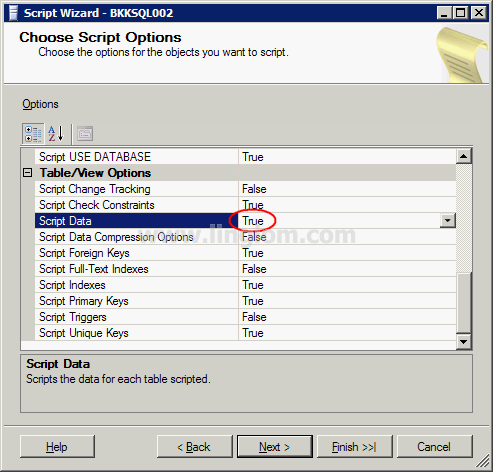 On Choose Script Options, set Script Database Create to False and Script for Server Version to SQL Server 2005. Note: You can set Script Database Create to True if your source and destination for store database files are the same location. Note: Set this option to true to include data on each table to a script. 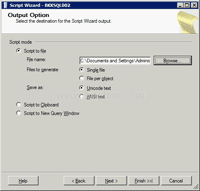 On Output Option, select a destination for the output script. 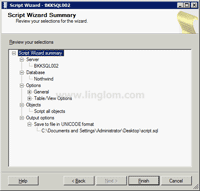 Select Script to file and browse to the location that you want. Click Next. 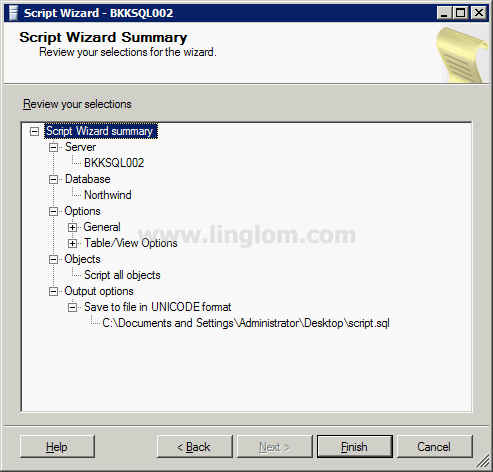 On Script Wizard Summary, you can review your selections. Then, click Finish. 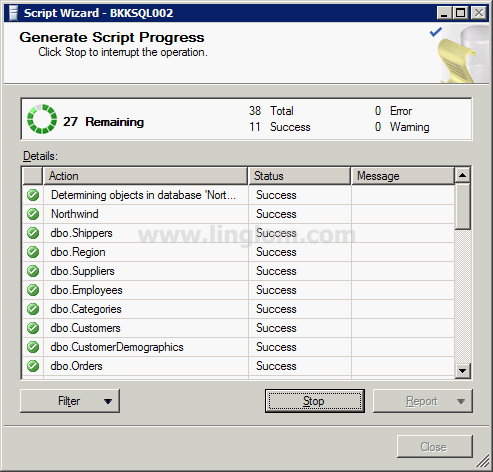 On Generate Script Progress, the wizard is creating a SQL Server script. 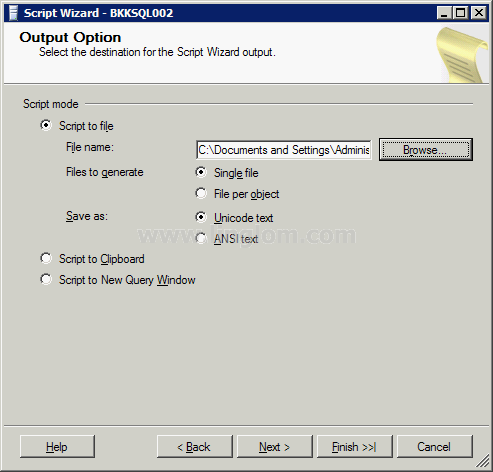 When the script has been completed, you see the output file as similar the figure below. 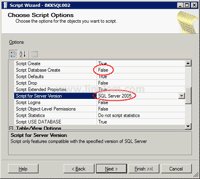 Connect to SQL Server 2005, create a new database. Right-click Database -> New Database. 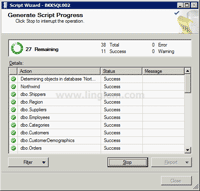 Note: If you have set Script Database Create to True on step 4, you don’t have to create a database manually. Type ‘Northwind’ as database name. Click OK. 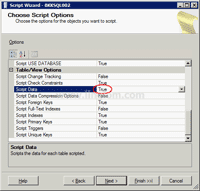 Execute the SQL Server script file that you have created. 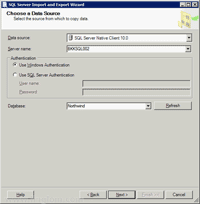 Now the database ‘Northwind’ is restored on SQL Server 2005. 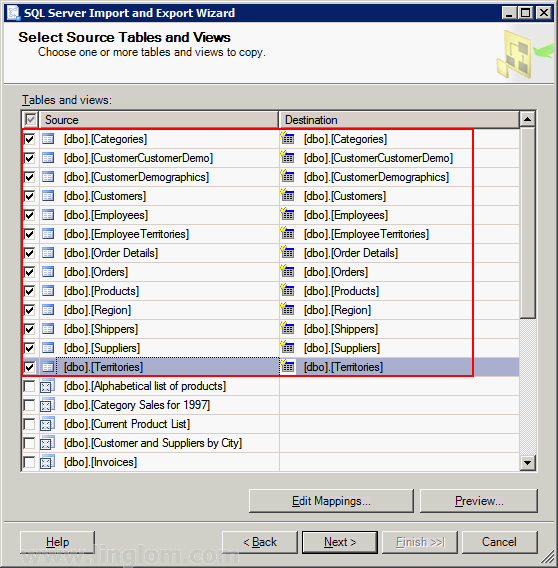 On this post, you see how to export tables on ‘Northwind’ database from SQL Server 2008 to SQL Server 2005 using export data wizard. 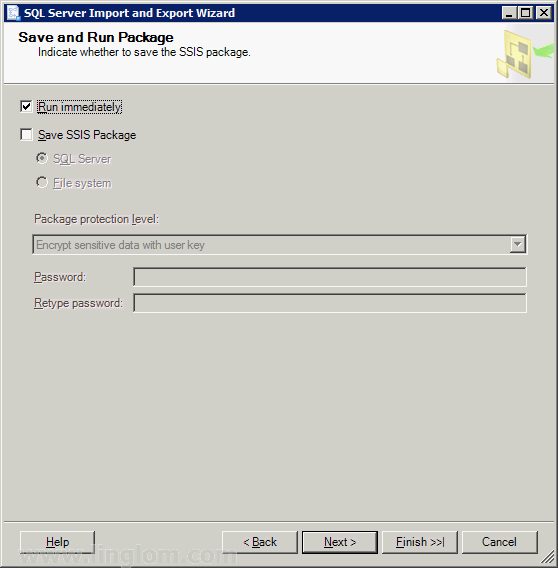 On Microsoft SQL Server Management Studio, connects to SQL Server 2008. 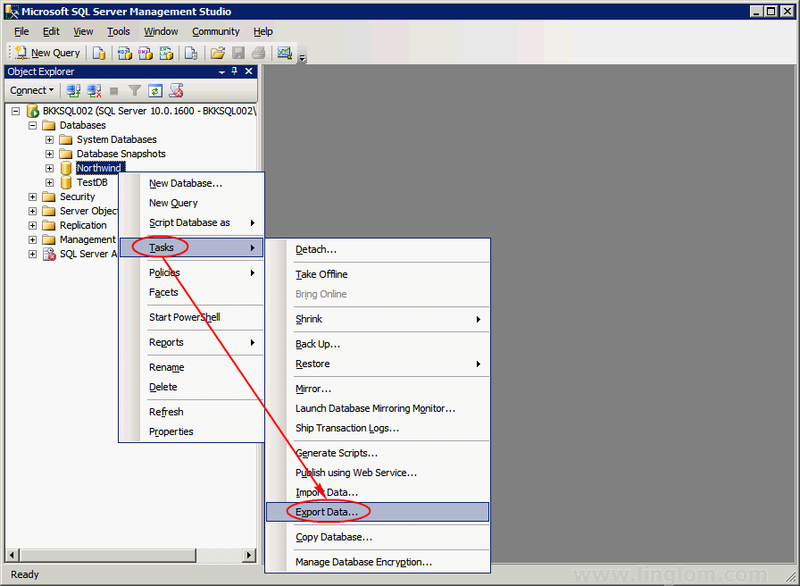 Right-click on the database that you want to export data -> select Tasks -> Export Data. 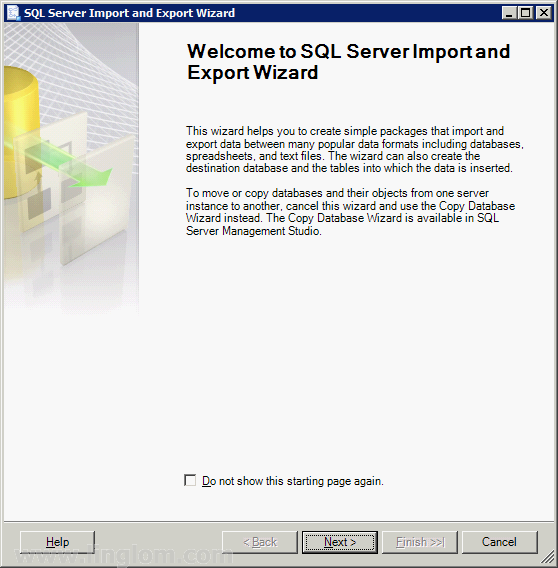 On Welcome to SQL Server Import and Export Wizard, click Next. 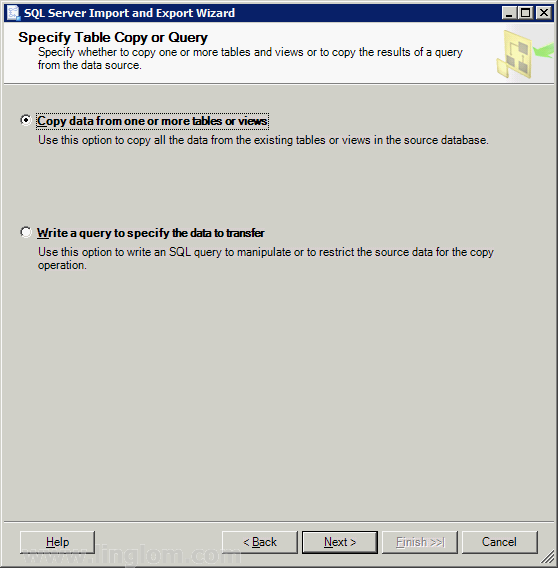 On Choose a Data Source, select the source from which to copy data. 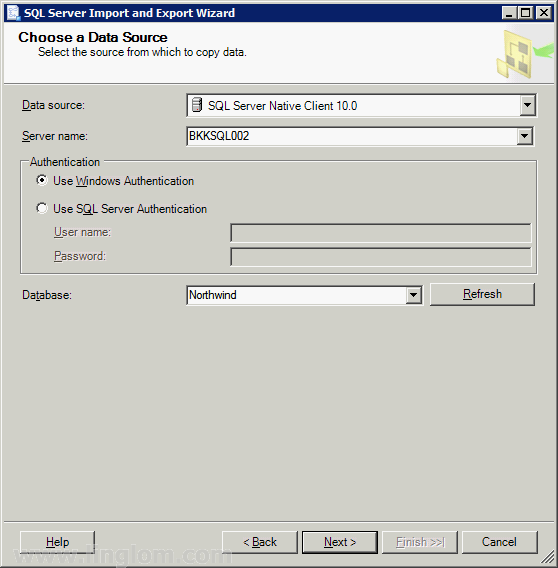 Set Data source to SQL Server Native Client 10.0. 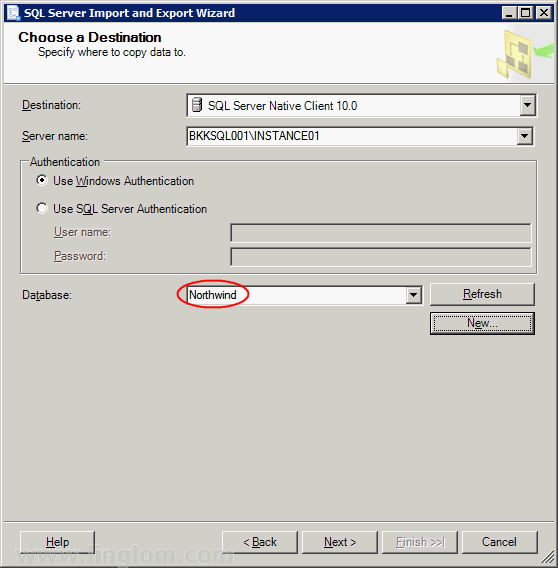 Verify that Server name is the source of SQL Server 2008 that you want and select Database as ‘Northwind’. Click Next. 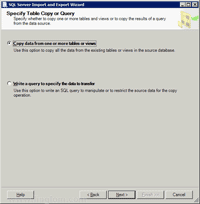 On Choose a Destination, specify where to copy data to. 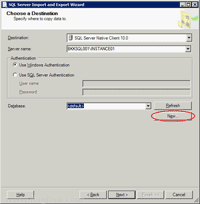 Set Destination to SQL Server Native Client 10.0. 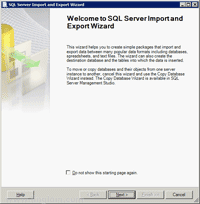 Type the Server name to the destination of SQL Server 2005 that you want. You can also click Refresh to verify if you can connect to the specify server name. 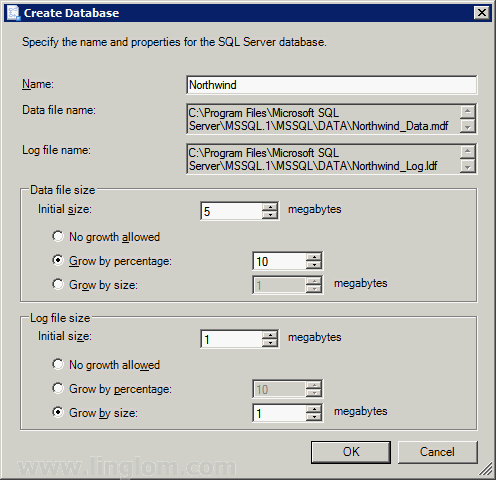 Currently, I don’t have ‘Northwind’ database on SQL Server 2005 so I will create a new one, click New. On Create Database, type name as ‘Northwind’ and click OK.
Back to Choose a Destination, I have created ‘Northwind’ database so select it as Database. Click Next. 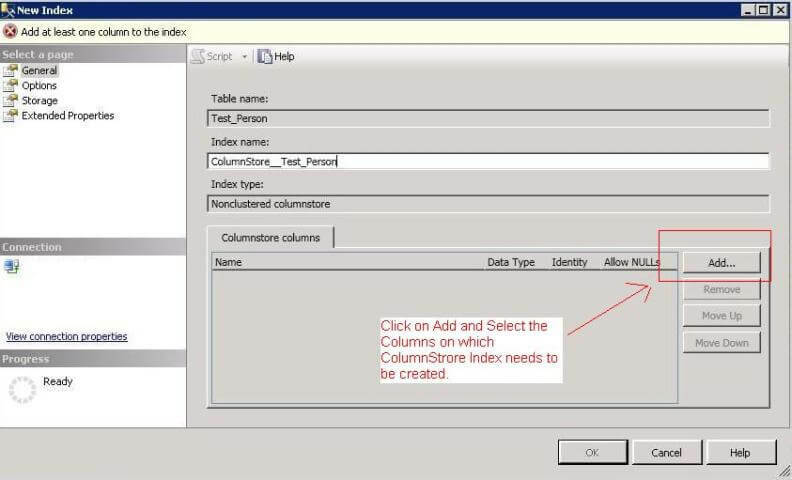 On Specify Table Copy or Query, select Copy data from one or more tables or views and click Next. On Select Sources Tables and Views, select tables that you want to export. 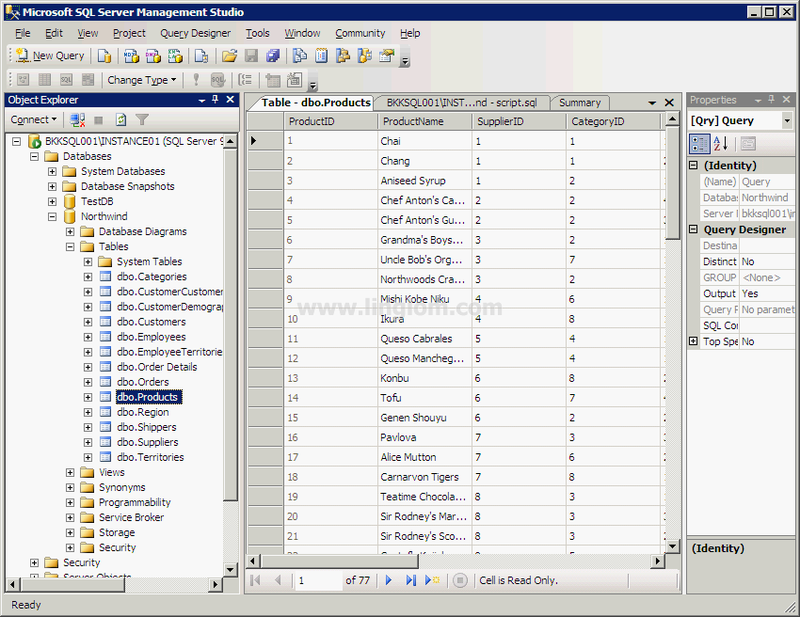 On this example, I select all tables on ‘Northwind’ database. On Save and Run Package, click Next. On Complete the Wizard, you can verify the choices made in the wizard. Then, click Finish. Wait until the wizard finishes execution. 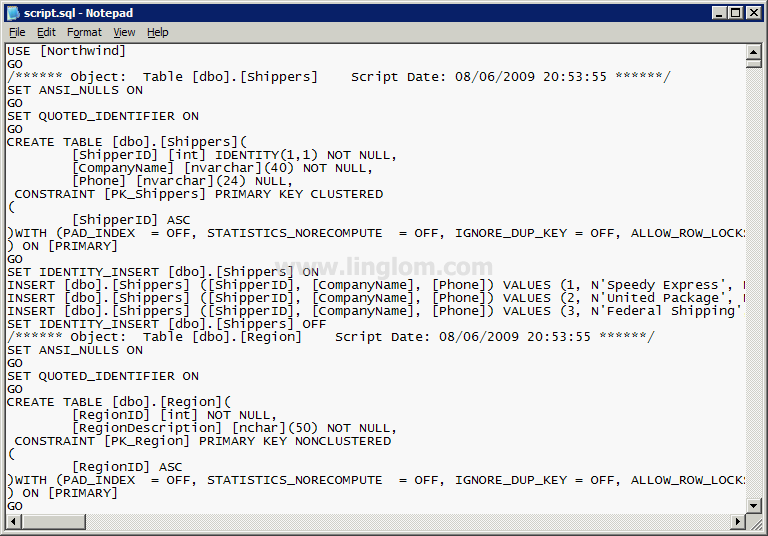 Now I have exported tables of ‘Northwind’ database from SQL Server 2008 to SQL Server 2005 successfully. 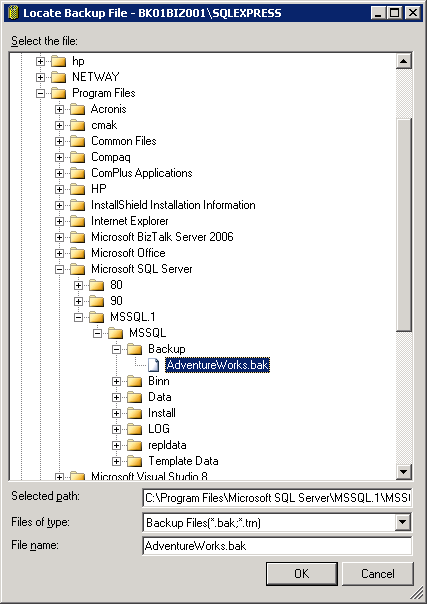 Now I will backup AdventureWorks database on BKKSQL2005 which runs Microsoft SQL Server 2005 to a file. Connect to source server. 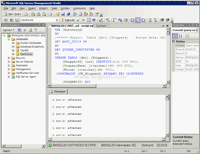 Open Microsoft SQL Server Management Studio and connect to BKKSQL2005. 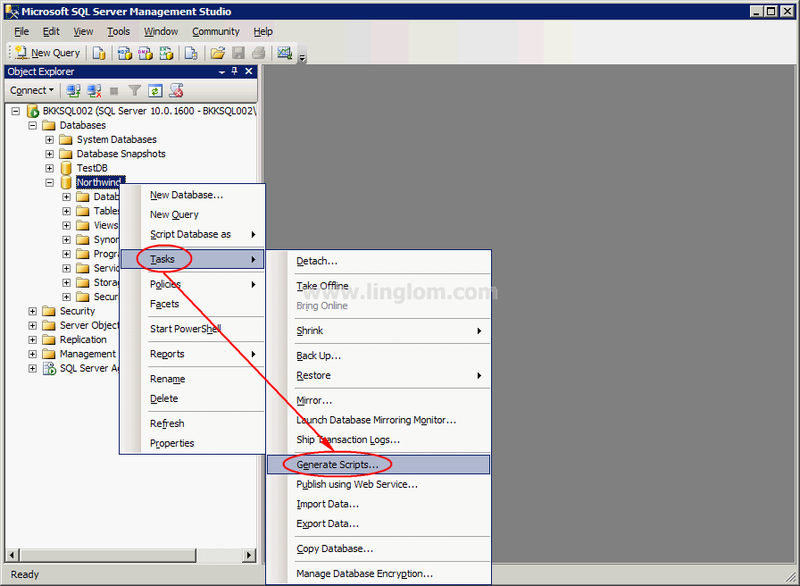 On Back Up Database window, you can configure about backup information. If you’re not familiar these configurations, you can leave default values. Here are some short descriptions. 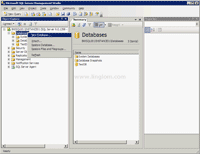 Database – a database that you want to backup. 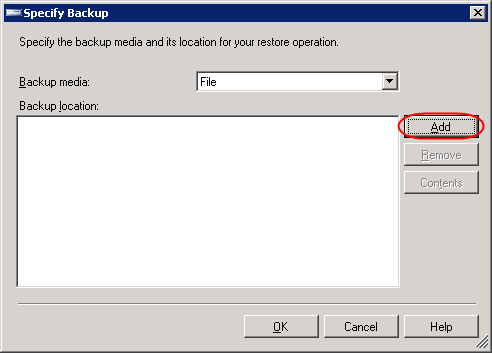 Backup type – you can select 2 options: Full and Differential. If this is the first time you backup the database, you must select Full. Name – Name of this backup, you can name anything as you want. Destination – the file that will be backup to. You can leave as default. Default will backup to “C:\Program Files\Microsoft SQL Server\MSSQL.1\MSSQL\Backup”. Click OK to proceed backup. Wait for a while and you’ll see a pop-up message when backup is finished. Browse to the destination, you’ll see a backup file (.bak format) which you can copy to other server for restore in the next step. Default backup directory is “C:\Program Files\Microsoft SQL Server\MSSQL.1\MSSQL\Backup”. 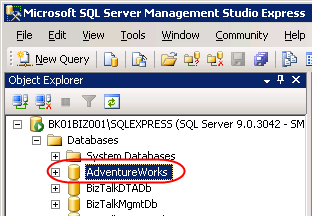 Next, I will restore the AdventureWorks database from a file that I’ve created above to BK01BIZ001 which runs Microsoft SQL Server Express Edition. 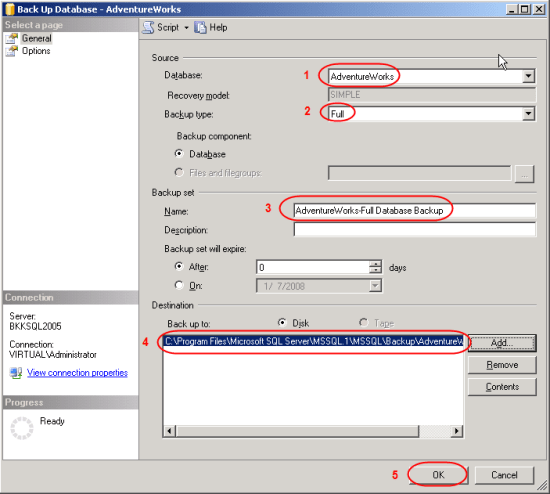 Copy the backup file from source server to destination server. I’ve copied into the same directory as source server. Connect to destination server. 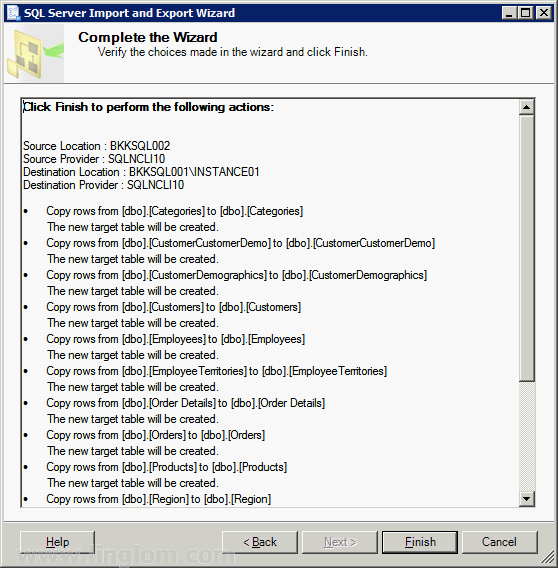 Open Microsoft SQL Server Management Studio Express and connect to BK01BIZ001. On Specify Backup, ensure that Backup media is “File” and click Add. On Locate Backup File, select the backup file. This is the backup file that was created in Backup a database section and was copied to this server. Click OK. OK.
Back to Restore Database window. On Destination for restore, select “AdventureWorks”. Note: If you haven’t added the backup file on Source before (step 4-6), you won’t see the database name on Destination. On Source for restore, check the box in front of the backup name (in Restore column). Wait until restore finish and there’ll be a pop-up message notify. 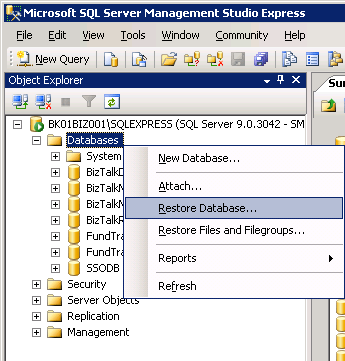 Now you’ll see the restored database on the destination SQL Server. This chapter focuses specifically on the Exchange Server 2010 components required for design. Key decision-making factors influencing design are presented and tied into overall strategy. All critical pieces of information required to design Exchange Server 2010 implementations are outlined and explained. Transport and access improvements—All client access is now funneled through the Client Access server (CAS) role in an organization, which allows for improvements in client access and limited end-user disruption during mailbox moves and maintenance. In addition, Exchange Server 2010 guards against lost emails due to hardware failures by keeping “shadow copies” of mail data on Hub and Edge Transport servers that can be re-sent in the event of loss. Integrated archiving capabilities—Exchange Server 2010 provides users and administrators the ability to archive messages for the purpose of cleaning up a mailbox of old messages, as well as for legal reasons for applying a retention policy on key messages. In addition, a second archive mailbox can be associated with a user’s primary mailbox, allowing seamless access to the archived messages from OWA or full Outlook. Users can simply drag and drop messages into their archive folder, or a policy or rule can be set to have messages automatically moved to the archive folder. “Access anywhere” improvements—Microsoft has focused a great deal of Exchange Server 2010 development time on new access methods for Exchange Server, including an enhanced Outlook Web App (OWA) that works with a variety of Microsoft and third-party browsers, Microsoft ActiveSync improvements, improved Outlook Voice Access (OVA), unified messaging support, and Outlook Anywhere enhancements. Having these multiple access methods greatly increases the design flexibility of Exchange Server because end users can access email via multiple methods. Protection and compliance enhancements—Exchange Server 2010 now includes a variety of antispam, antivirus, and compliance mechanisms to protect the integrity of messaging data. Exchange Server 2010 also includes the capability to establish a second, integrated archive mailbox for users that is made available through all traditional access mechanisms, including OWA. This allows for older archived items to be available to users without the mail actually being stored in the individual’s mailbox, enabling an organization to do better storage management and content management of mail messages throughout the enterprise. Resource forest—The Resource forest model in Exchange Server 2010 involves the deployment of a dedicated forest exclusively used for Exchange Server itself, and the only user accounts within it are those that serve as a placeholder for a mailbox. These user accounts are not logged onto by the end users, but rather the end users are given access to them across cross-forest trusts from their particular user forest to the Exchange Server forest. More information n on this deployment model can be found in Chapter 4. Note – Unlike previous versions of the software, Microsoft provides only a single set of media for Exchange Server 2010. When installed, server version can be set by simply inputting a licensed key. A server can be upgraded from the Trial version to Standard/Enterprise or from Standard to Enterprise. It cannot, however, be downgraded. Because Exchange Server 2010 relies on the Windows Server 2008 AD for its directory, it is therefore important to include AD in the design plans. In many situations, an AD implementation, whether based on Windows 2000 Server, Windows Server 2003, or Windows Server 2008, AD already exists in the organization. In these cases, it is necessary only to plan for the inclusion of Exchange Server into the forest. 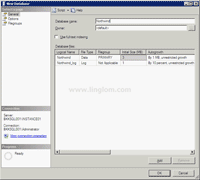 Note – Exchange Server 2010 has several key requirements for AD. 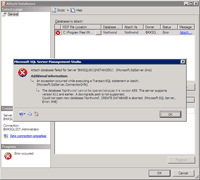 First, all domains and the forest must be at Windows Server 2003 functional levels or higher. Second, it requires that at least one domain controller in each site that includes Exchange Server be at least Windows Server 2003 SP2 or Windows Server 2008. If an AD structure is not already in place, a new AD forest must be established. Designing the AD forest infrastructure can be complex, and can require nearly as much thought into design as the actual Exchange Server configuration itself. Therefore, it is important to fully understand the concepts behind AD before beginning an Exchange Server 2010 design. In short, a single “instance” of AD consists of a single AD forest. A forest is composed of AD trees, which are contiguous domain namespaces in the forest. Each tree is composed of one or more domains, as illustrated in Figure 3.1. Political limitations—Some organizations have specific political reasons that force the creation of multiple AD forests. For example, if a merged corporate entity requires separate divisions to maintain completely separate information technology (IT) infrastructures, more than one forest is necessary. Security concerns—Although the AD domain serves as a de facto security boundary, the “ultimate” security boundary is effectively the forest. In other words, it is possible for user accounts in a domain in a forest to hack into domains within the same forest. Although these types of vulnerabilities are not common and are difficult to do, highly security-conscious organizations should implement separate AD forests. Application functionality—A single AD forest shares a common directory schema, which is the underlying structure of the directory and must be unique across the entire forest. In some cases, separate branches of an organization require that certain applications, which need extensions to the schema, be installed. This might not be possible or might conflict with the schema requirements of other branches. These cases might require the creation of a separate forest. Exchange-specific functionality (resource forest)—In certain circumstances, it might be necessary to install Exchange Server 2010 into a separate forest, to enable Exchange Server to reside in a separate schema and forest instance. An example of this type of setup is an organization with two existing AD forests that creates a third forest specifically for Exchange Server and uses cross-forest trusts to assign mailbox permissions. The simplest designs often work the best. The same principle applies to AD design. The designer should start with the assumption that a simple forest and domain structure will work for the environment. However, when factors such as those previously described create constraints, multiple forests can be established to satisfy the requirements of the constraints. After the AD forest structure has been chosen, the domain structure can be laid out. As with the forest structure, it is often wise to consider a single domain model for the Exchange Server 2010 directory. In fact, if deploying Exchange Server is the only consideration, this is often the best choice. There is one major exception to the single domain model: the placeholder domain model. The placeholder domain model has an isolated domain serving as the root domain in the forest. The user domain, which contains all production user accounts, would be located in a separate domain in the forest, as illustrated in Figure 3.2. The placeholder domain structure increases security in the forest by segregating high-level schema-access accounts into a completely separate domain from the regular user domain. Access to the placeholder domain can be audited and restricted to maintain tighter control on the critical schema. The downside to this model, however, is the fact that the additional domain requires a separate set of domain controllers, which increases the infrastructure costs of the environment. In general, this makes this domain model less desirable for smaller organizations because the trade-off between increased cost and less security is too great. 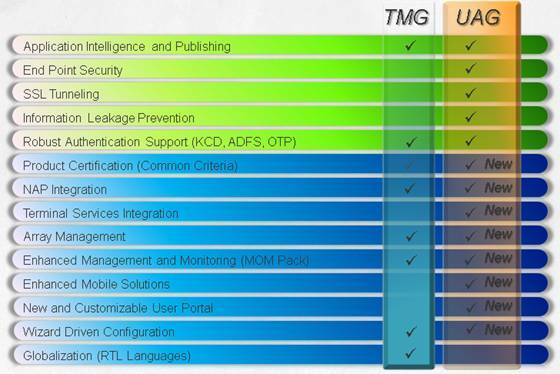 Larger organizations can consider the increased security provided by this model, however. Several key components of AD must be installed within an organization to ensure proper Exchange Server 2010 and AD functionality. In smaller environments, many of these components can be installed on a single machine, but all need to be located within an environment to ensure server functionality. In addition to being tightly integrated with AD, Exchange Server 2010 is joined with the Domain Name System (DNS). DNS serves as the lookup agent for Exchange Server 2010, AD, and most new Microsoft applications and services. DNS translates common names into computer-recognizable IP addresses. For example, the name http://www.cco.com translates into the IP address of 12.155.166.151. AD and Exchange Server 2010 require that at least one DNS server be made available so that name resolution properly occurs. Given Exchange Server 2010’s dependency on DNS, a common DNS namespace must be chosen for the AD structure to reside in. In multiple tree domain models, this could be composed of several DNS trees, but in small organization environments, this normally means choosing a single DNS namespace for the AD domain. There is a great deal of confusion between the DNS namespace in which AD resides and the email DNS namespace in which mail is delivered. Although they are often the same, in many cases there are differences between the two namespaces. For example, CompanyABC’s AD structure is composed of a single domain named abc.internal, and the email domain to which mail is delivered is companyabc.com. The separate namespace, in this case, was created to reduce the security vulnerability of maintaining the same DNS namespace both internally and externally (published to the Internet). For simplicity, CompanyABC could have chosen companyabc.com as its AD namespace. This choice increases the simplicity of the environment by making the AD logon user principal name (UPN) and the email address the same. For example, the user Pete Handley is pete@companyabc.com for logon, and pete@companyabc.com for email. This option is the choice for many organizations because the need for user simplicity often trumps the higher security. Because all Exchange Server directory lookups use AD, it is vital that the essential AD global catalog information is made available to each Exchange server in the organization. For many small offices with a single site, this simply means that it is important to have a full global catalog server available in the main site. The global catalog is an index of the AD database that contains a partial copy of its contents. All objects within the AD tree are referenced within the global catalog, which enables users to search for objects located in other domains. Every attribute of each object is not replicated to the global catalogs, only those attributes that are commonly used in search operations, such as first name and last name. Exchange Server 2010 uses the global catalog for the email-based lookups of names, email addresses, and other mail-related attributes. 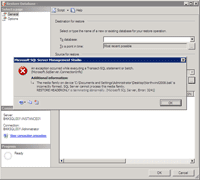 Note – Exchange Server 2010 cannot make use of Windows Server 2008 Read Only Domain Controllers (RODCs) or Read Only Global Catalog (ROGC) servers, so be sure to plan for full GCs and DCs for Exchange Server. Because full global catalog replication can consume more bandwidth than standard domain controller replication, it is important to design a site structure to reflect the available WAN link capacity. 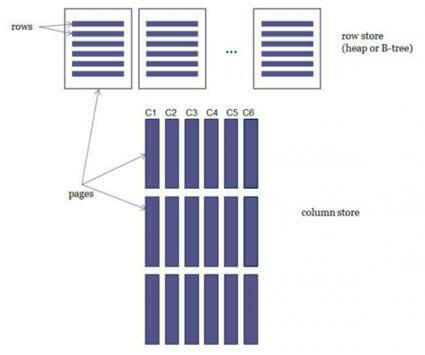 If a sufficient amount of capacity is available, a full global catalog server can be deployed. If, however, capacity is limited, universal group membership caching can be enabled to reduce the bandwidth load. Forefront Identity Manager (FIM) enables out-of-the-box replication of objects between two separate AD forests. This concept becomes important for organizations with multiple Exchange Server implementations that want a common Global Address List for the company. Previous iterations of FIM required an in-depth knowledge of scripting to be able to synchronize objects between two forests. FIM, on the other hand, includes built-in scripts that can establish replication between two Exchange Server 2010 AD forests, making integration between forests easier. Previous versions of Exchange Server essentially forced many organizations into deploying servers in sites with greater than a dozen or so users. With the concept of site consolidation in Exchange Server 2010, however, smaller numbers of Exchange servers can service clients in multiple locations, even if they are separated by slow WAN links. For small and medium-sized organizations, this essentially means that a small handful of servers is required, depending on availability needs. Larger organizations require a larger number of Exchange servers, depending on the number of sites and users. In addition, Exchange Server 2010 introduces new server role concepts, which should be understood so that the right server can be deployed in the right location. 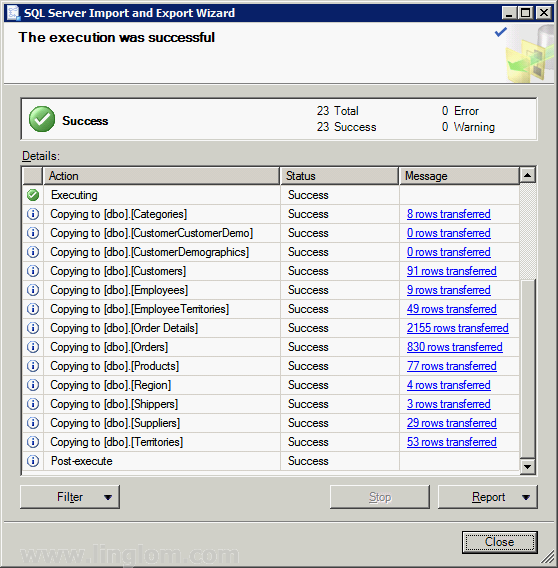 Exchange Server 2010 firmed up the server role concept outlined with Exchange Server 2007. Before Exchange Server 2007/2010, server functionality was loosely termed, such as referring to an Exchange server as an OWA or front-end server, bridgehead server, or a mailbox or back-end server. In reality, there was no set terminology that was used for Exchange server roles. Exchange Server 2010, on the other hand, distinctly defines specific roles that a server can hold. Multiple roles can reside on a single server, or multiple servers can have the same role. By standardizing on these roles, it becomes easier to design an Exchange Server environment by designating specific roles for servers in specific locations. Client access server (CAS)—The CAS role allows for client connections via nonstandard methods such as Outlook Web App (OWA), Exchange ActiveSync, Post Office Protocol 3 (POP3), and Internet Message Access Protocol (IMAP). Exchange Server 2010 also forces MAPI traffic and effectively all client traffic through the CAS layer. CAS servers are the replacement for Exchange 2000/2003 front-end servers and can be load balanced for redundancy purposes. As with the other server roles, the CAS role can coexist with other roles for smaller organizations with a single server, for example. Edge Transport server—The Edge Transport server role was introduced with Exchange Server 2007, and consists of a standalone server that typically resides in the demilitarized zone (DMZ) of a firewall. This server filters inbound SMTP mail traffic from the Internet for viruses and spam, and then forwards it to internal Hub Transport servers. Edge Transport servers keep a local AD Application Mode (ADAM) instance that is synchronized with the internal AD structure via a mechanism called EdgeSync. This helps to reduce the surface attack area of Exchange Server. The Edge Transport role can only exist by itself on a server, it cannot be combined with other roles. Hub Transport server—The Hub Transport server role acts as a mail bridgehead for mail sent between servers in one AD site and mail sent to other AD sites. There needs to be at least one Hub Transport server within an AD site that contains a server with the mailbox role, but there can also be multiple Hub Transport servers to provide for redundancy and load balancing. HT roles are also responsible for message compliance and rules. The HT role can be combined with other roles on a server, and is often combined with the CAS role. Mailbox server—The mailbox server role is intuitive; it acts as the storehouse for mail data in users’ mailboxes and down-level public folders if required. All connections to the mailbox servers are proxied through the CAS servers. Unified Messaging server—The Unified Messaging server role allows a user’s Inbox to be used for voice messaging and fax capabilities. Any or all of these roles can be installed on a single server or on multiple servers. For smaller organizations, a single server holding all Exchange Server roles is sufficient. For larger organizations, a more complex configuration might be required. For more information on designing large and complex Exchange Server implementations, see Chapter 4. In some cases with very small organizations, the number of users is small enough to warrant the installation of all AD and Exchange Server 2010 components on a single server. This scenario is possible, as long as all necessary components—DNS, a global catalog domain controller, and Exchange Server 2010—are installed on the same hardware. In general, however, it is best to separate AD and Exchange Server onto separate hardware wherever possible. At its core, Exchange Server 2010 essentially acts as a storehouse for mailbox data. Access to the mail within the mailboxes can take place through multiple means, some of which might be required by specific services or applications in the environment. A good understanding of what these services are and if and how your design should support them is warranted. The “heavy” client of Outlook, Outlook 2007, has gone through a significant number of changes, both to the look and feel of the application, and to the back-end mail functionality. The look and feel has been streamlined based on Microsoft research and customer feedback. The latest Outlook client, Outlook 2010, uses the Office ribbon introduced with Office 2007 to improve the client experience. Outlook connects with Exchange servers via CAS servers, improving the scalability of the environment. In addition to MAPI compression, Outlook 2010/2007 expands upon the Outlook 2003 ability to run in cached mode, which automatically detects slow connections between client and server and adjusts Outlook functionality to match the speed of the link. When a slow link is detected, Outlook can be configured to download only email header information. When emails are opened, the entire email is downloaded, including attachments if necessary. This drastically reduces the amount of bits across the wire that is sent because only those emails that are required are sent across the connection. The Outlook 2010/2007 client is the most effective and full-functioning client for users who are physically located close to an Exchange server. With the enhancements in cached mode functionality, however, Outlook 2010/2007 can also be effectively used in remote locations. When making the decision about which client to deploy as part of a design, you should keep these concepts in mind. The Outlook Web App (OWA) client in Exchange Server 2010 has been enhanced and optimized for performance and usability. There is now very little difference between the full function client and OWA. With this in mind, OWA is now an even more efficient client for remote access to the Exchange server. The one major piece of functionality that OWA does not have, but the full Outlook 2007 client does, is offline mail access support. If this is required, the full client should be deployed. Exchange ActiveSync (EAS) support in Exchange Server 2010 allows a mobile client, such as a Pocket PC device or mobile phone, to synchronize with the Exchange server, allowing for access to email from a handheld device. EAS also supports Direct Push technology, which allows for instantaneous email delivery to supported handheld devices such as Windows Mobile 5.0/6.x or other third-party ActiveSync enabled devices. The Simple Mail Transfer Protocol (SMTP) is an industry-standard protocol that is widely used across the Internet for mail delivery. SMTP is built in to Exchange servers and is used by Exchange Server systems for relaying mail messages from one system to another, which is similar to the way that mail is relayed across SMTP servers on the Internet. Exchange Server is dependent on SMTP for mail delivery and uses it for internal and external mail access. By default, Exchange Server 2010 uses DNS to route messages destined for the Internet out of the Exchange Server topology. If, however, a user wants to forward messages to a smarthost before they are transmitted to the Internet, an SMTP connector can be manually set up to enable mail relay out of the Exchange Server system. SMTP connectors also reduce the risk and load on an Exchange server by off-loading the DNS lookup tasks to the SMTP smarthost. SMTP connectors can be specifically designed in an environment for this type of functionality. One very effective and improved client access method to Exchange Server 2010 is known as Outlook Anywhere. This technology was previously referred to as RPC over HTTP(s) or Outlook over HTTP(s). This technology enables standard Outlook 2010/2007/2003 access across firewalls. The Outlook client encapsulates Outlook RPC packets into HTTP or HTTPS packets and sends them across standard web ports (80 and 443), where they are then extracted by the Exchange Server 2010 system. This technology enables Outlook to communicate using its standard RPC protocol, but across firewalls and routers that normally do not allow RPC traffic. The potential uses of this protocol are significant because many situations do not require the use of cumbersome VPN clients. As previously mentioned, Exchange Server 2010 only operates on the Windows Server 2008 (Service Pack 2 or later) or Windows Server 2008 R2 operating systems. The enhancements to the operating system, especially in regard to security, make Windows Server 2008 the optimal choice for Exchange Server. The Standard Edition of Windows Server 2008 is sufficient for any Exchange Server installation. Note – Contrary to popular misconception, the Enterprise Edition of Exchange Server can be installed on the Standard Edition of the operating system, and vice versa. Although there has been a lot of confusion on this concept, both versions of Exchange Server were designed to interoperate with either version of Windows. The single most important design element that improves the efficiency and speed of Exchange Server is the separation of the Exchange Server database and the Exchange Server logs onto a separate hard drive volume. Because of the inherent differences in the type of hard drive operations performed (logs perform primarily write operations, databases primarily read), separating these elements onto separate volumes dramatically increases server performance. 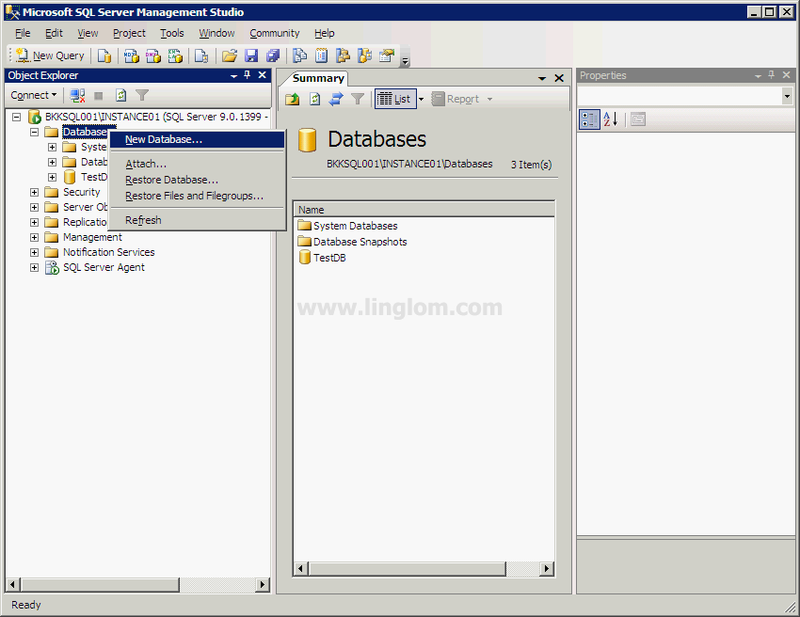 Figure 3.3 illustrates some examples of how the database and log volumes can be configured. 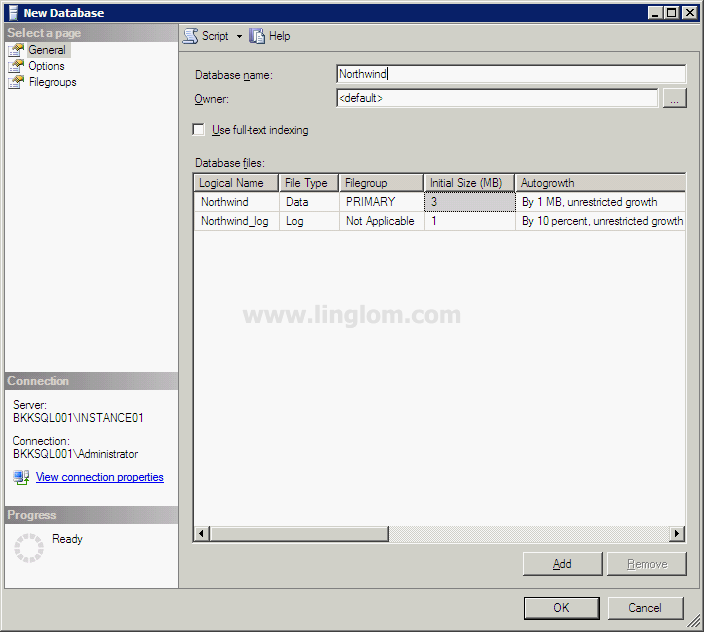 Database and log volume configuration. On Server1, the OS and logs are located on the same mirrored C:\ volume and the database is located on a separate RAID-5 drive set. With Server2, the configuration is taken up a notch, with the OS only on C:\, the logs on D:\, and the database on the RAID-5 E:\ volume. Finally, Server3 is configured in the optimal configuration, with separate volumes for each database and a volume for the log files. The more advanced a configuration, the more detailed and complex the drive configuration can get. However, the most important factor that must be remembered is to separate the Exchange Server database from the logs wherever possible. Note – With the use of Database Availability Groups (DAGs) in Exchange Server 2010, the performance of the disk infrastructure has become less of a concern. DAGs enable an organization’s mailboxes to be spread across multiple servers and to exist in multiple locations (up to 16), which reduces the need for expensive SAN disks and enables Exchange Server to be installed on DAS or SATA disk. Reduce database restore time—Multiple databases (rather than a smaller number of larger databases) take less time to restore from tape. This concept can be helpful if there is a group of users who require quicker recovery time (such as management). All mailboxes for this group could then be placed in a separate database to provide quicker recovery time in the event of a server or database failure. Provide for separate mailbox limit policies—Each database can be configured with different mailbox storage limits. For example, the standard user database could have a 200-MB limit on mailboxes, and the management database could have a 500-MB limit. Mitigate risk by distributing user load—By distributing user load across multiple databases, the risk of losing all user mail connectivity is reduced. For example, if a single database failed that contained all users, no one would be able to mail. If those users were divided across three databases, however, only one third of those users would be unable to mail in the event of a database failure. With Secure by Default, all nonessential functionality in Exchange Server must be turned on if needed. This is a complete change from the previous Microsoft model, which had all services, add-ons, and options turned on and running at all times, presenting much larger security vulnerabilities than was necessary. Designing security effectively becomes much easier in Exchange Server 2010 because it now becomes necessary only to identify components to turn on, as opposed to identifying everything that needs to be turned off. 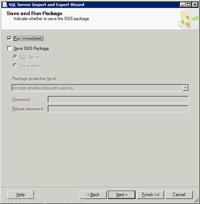 In addition to being secure by default, Exchange Server 2010 server roles are built in to templates used by the Security Configuration Wizard (SCW), which was introduced in Service Pack 1 for Windows Server 2003. Using the SCW against Exchange Server helps to reduce the surface attack area of a server. Although Windows Server 2008 presents a much smaller target for hackers, viruses, and exploits by virtue of the Secure by Default concept, it is still important to keep the OS up to date against critical security patches and updates. Currently, two approaches can be used to automate the installation of server patches. The first method involves configuring the Windows Server 2008 Automatic Updates client to download patches from Microsoft and install them on a schedule. The second option is to set up an internal server to coordinate patch distribution and management. The solution that Microsoft supplies for this functionality is known as Windows Server Update Services (WSUS). WSUS enables a centralized server to hold copies of OS patches for distribution to clients on a preset schedule. WSUS can be used to automate the distribution of patches to Exchange Server 2010 servers, so that the OS components will remain secure between service packs. WSUS might not be necessary in smaller environments, but can be considered in medium-sized to large organizations that want greater control over their patch management strategy. Exchange Server 2010 offers a broad range of functionality and improvements to messaging and is well suited for organizations of any size. With proper thought for the major design topics, a robust and reliable Exchange Server email solution can be put into place that will perfectly complement the needs of any organization. When Exchange Server design concepts have been fully understood, the task of designing the Exchange Server 2010 infrastructure can take place. 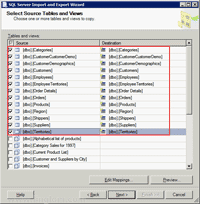 Use Database Availability Groups (DAGs) to distribute multiple copies of all mailboxes to multiple locations, taking advantage of HA and DR capabilities that are built into Exchange Server 2010. Separate the Exchange Server log and database files onto separate physical volumes whenever possible, but also be cognizant of the fact that Exchange Server can be installed on slower, cheaper disks when using DAGs. Plan for a Windows Server 2003 functional forest and at least one Windows Server 2003 SP2 or Windows Server 2008 domain controller in each site that will run Exchange Server. Integrate an antivirus and backup strategy into Exchange Server design. Keep a local copy of a full global catalog close to any Exchange servers. Keep the OS and Exchange Server up to date through service packs and software patches, either manually or via Windows Server Update Services. Keep the AD design simple, with a single forest and single domain, unless a specific need exists to create more complexity. Identify the client access methods that will be supported and match them with the appropriate Exchange Server 2010 technology. Monitor DNS functionality closely in the environment on the AD domain controllers. Sometimes things that seem complicated are much easier then you think and this is the power of using T-SQL to take care of repetitive tasks. One of these tasks may be the need to backup all databases on your server. This is not a big deal if you have a handful of databases, but I have seen several servers where there are 100+ databases on the same instance of SQL Server. You could use Enterprise Manager to backup the databases or even use Maintenance Plans, but using T-SQL is a much simpler and faster approach. 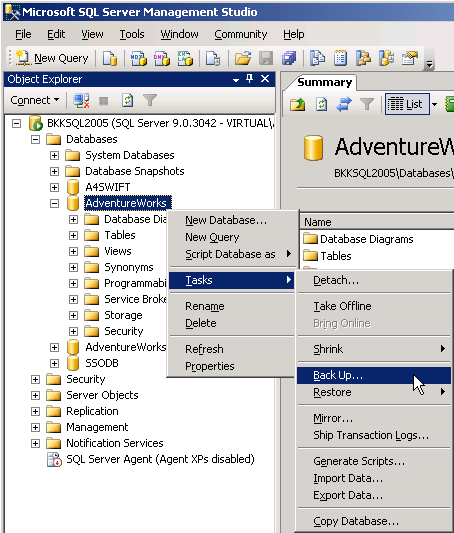 Here is the script that will allow you to backup each database within your instance of SQL Server. You will need to change the @path to the appropriate backup directory and each backup file will take on the name of “DBnameYYYDDMM.BAK”. 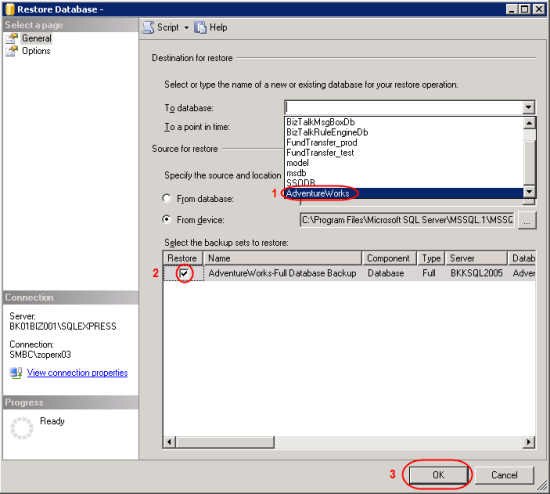 When upgrading databases from an older version of SQL Server using either the backup and restore method or detach and attach method the compatibility level does not automatically change and therefore your databases still act as though they are running using an earlier version of SQL Server. From an overall standpoint this is not a major problem, but there are certain features that you will not be able to take advantage of unless your database compatibly level is changed. This tip will show you how to check the current compatibly level, how to change the compatibly level and also some of the differences between earlier versions and SQL Server 2005. The first thing that you need to do is to check the compatibility level that your database is running under. As mentioned above any database that is upgraded using the backup and restore or detach and attach method will not change the compatibly level automatically, so you will need to check each database and make the change. 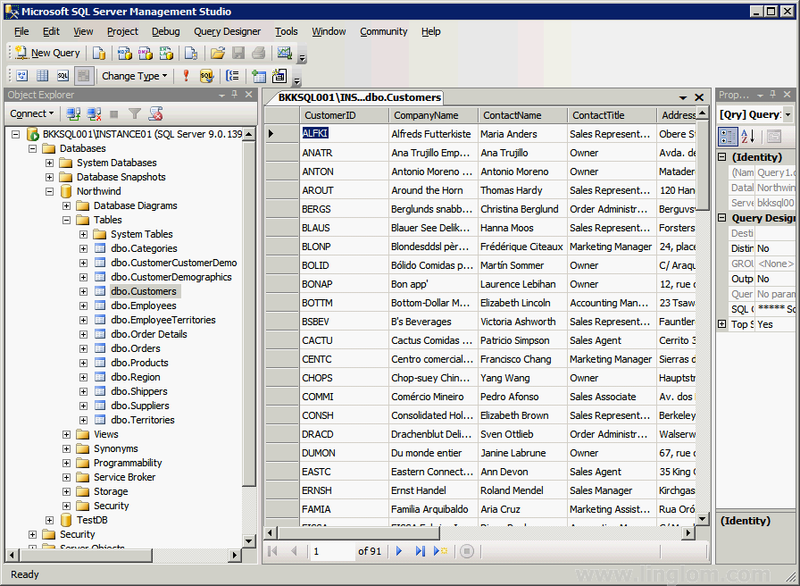 Or select directly from the sys.databases catalog to get the information for all databases. 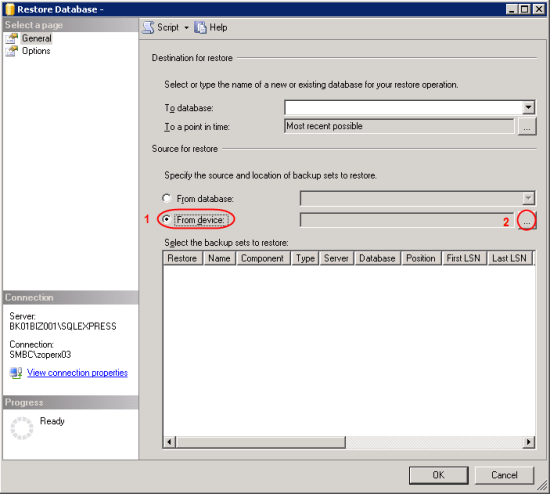 When issuing a CREATE DATABASE statement there is not a way to select which compatibility level you want to use. 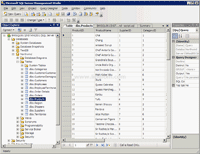 The compatibility level that is used is the compatibility level of your model database. 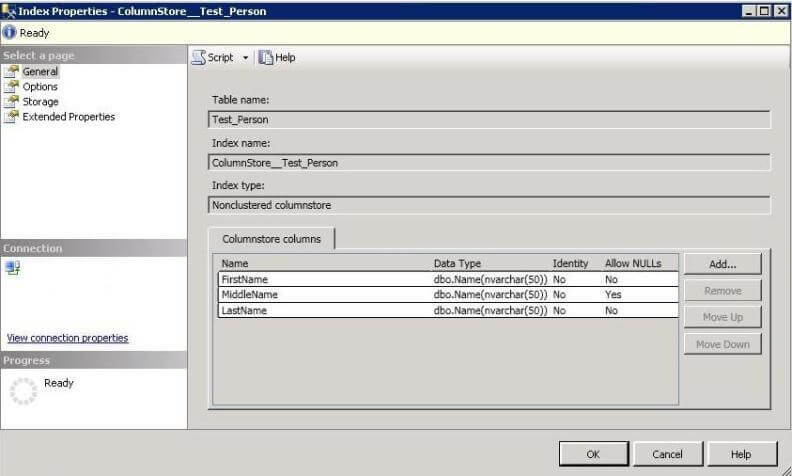 Here is a sample CREATE DATABASE command, but there is not an option to change the compatibility level. 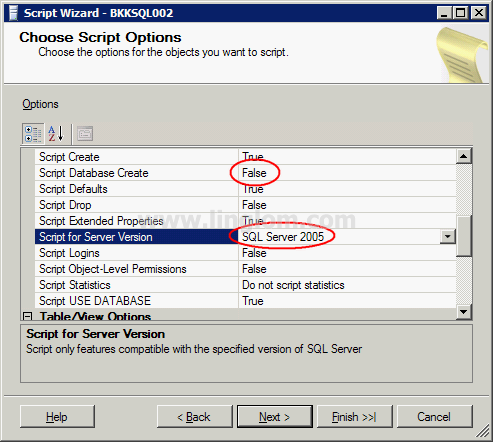 If we use the “Script” option we can see that SQL Server issues the CREATE DATABASE statement and then issues “sp_dbcmptlevel” to set the database compatibility level to 80 as shown below. In addition, each new compatibility level offers a new list of reserved keywords. Here is a list of the new keywords for SQL Server 2005. If one of these keywords is being used and your database is set to this compatibly level the commands will fail. To get around this you could put the keyword in either square brackets ([ ]) or use quotation marks (” “) such as [PIVOT] or “PIVOT”. 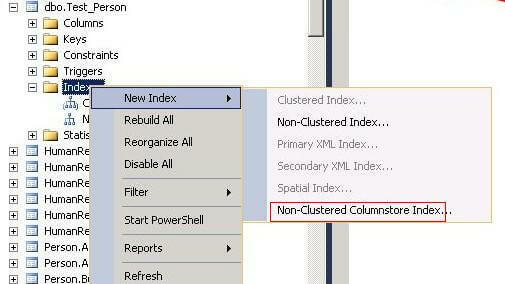 The compatibly level setting is used by SQL Server to determine how certain new features should be handled. This was setup so you could migrate your databases to a later release of SQL Server without having to worry about the application breaking. This setting can be changed forward and backwards if needed, so if you do change your compatibly level and find that there are problems you can set the value back again until you resolve all of the issues that you may be facing during the upgrade. In addition, there are certain features that only work if the database is set to the latest compatibly level, therefore to get all of the benefits of the version of SQL Server you are running you need to make sure you are using the latest compatibly level. One of the worst situations I can imagine for a database professional is to get a call reporting a production database is in a “Suspect” state and the business cannot continue. This is a “code red” situation where DBA needs to bring the database online as soon as possible. In this article, I will formulate couple of steps which may be used as a high level process to handle this situation. The first step is always to inform your customer about the outage before they come back to you. I find most of the times this proactive step becomes a life saver. In this way, you will not be questioned for the time you will spend to bring the database online. 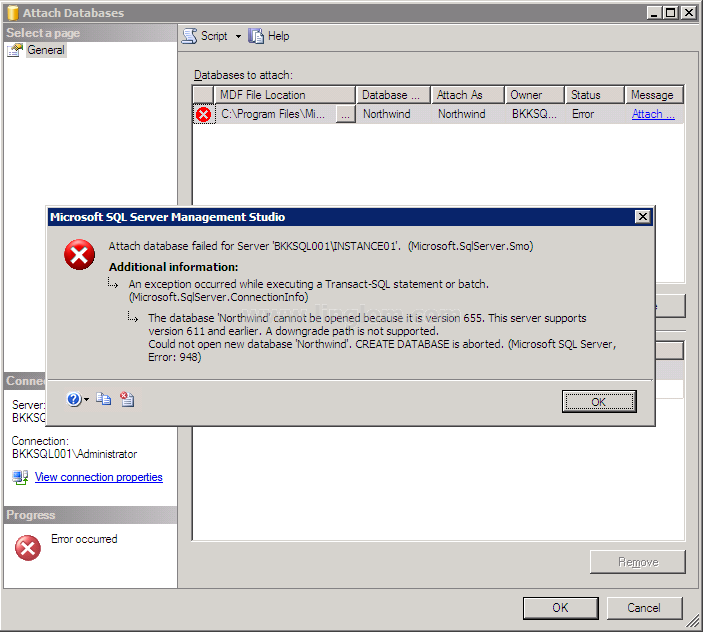 Then refer to the SQL Server error log to find the root cause of the issue. 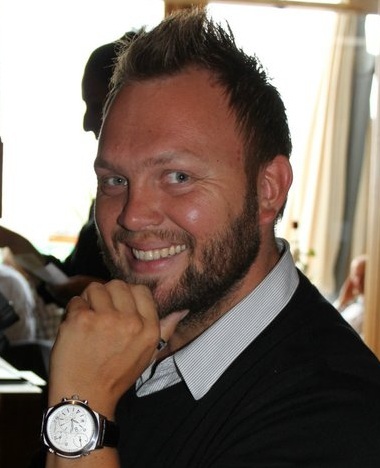 It will give you a clear reason mentioning why the database is in Suspect mode. 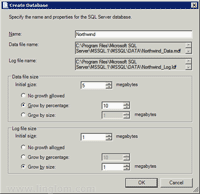 From SQL Server 2005 onwards, I recommend to use a filter while viewing the log and use “Database name” as the filter criteria. In this way you will only see the logs related to that particular database and then refer to the latest log/s for the root cause. Up until SQL Server 2000, the only option is reading the log from the latest entry backwards to find the root cause. 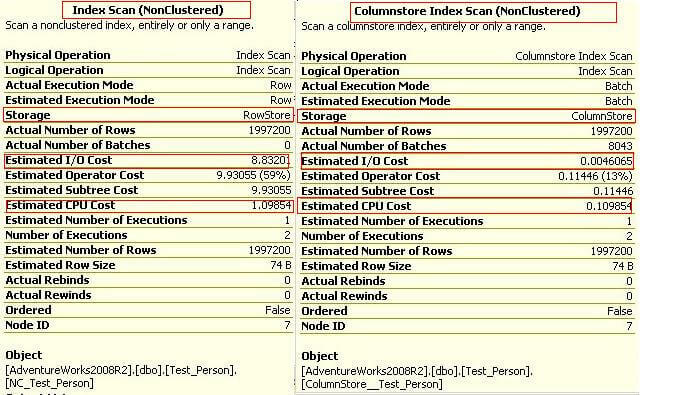 Assuming you found the reason why database is in suspect mode, now you need to take appropriate step to fix the issue. Here I will discuss some of the possible issues which can put a database in Suspect mode and recommend appropriate resolution. Possibility 1: Some one deleted/misplaced a data/log file when SQL Server was offline and the database can not start because of missing file. The solution is to place the missing data/log file in proper location. 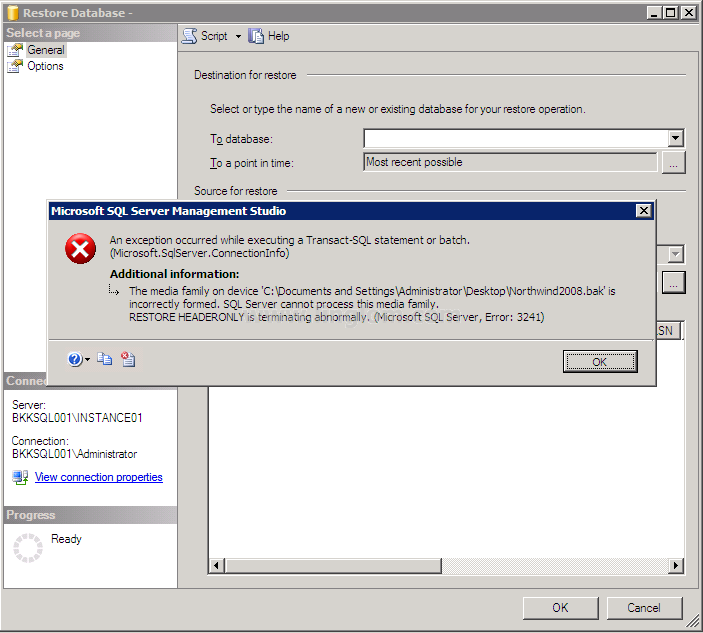 The SQL Server Error Log error message will give you the exact name and path of the missing file. 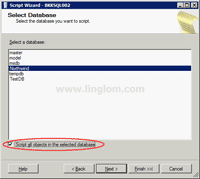 Once you place the file execute below command to bring your database online with no data loss. Possibility 3: This is a worst case scenario. Database is in suspect because of a corrupted transaction. This is a bad news as you may have to lose data at this point unless you have a good backup! Also this is the most common case I saw for putting an OLTP database in Suspect mode. The root cause of this issue is actually from a guarantee taken by SQL Server to ensure transaction consistency under fundamental ACID property of RDBMS. The root cause of this issue is most likely SQL server abruptly went down/restarted in the middle of a transaction and while coming back, SQL server could not complete (commit/rollback) the transaction. Caution! Below steps will cause you to lose data and hence are extremely dangerous to execute. I recommend trying all other possible options including calling Microsoft Support before executing below steps. Please note that as stated above this is an extremely dangerous command to execute. It is a one- way command (that is you can not rollback back this execution once you started it) which can cause loss in data or database integrity. Technically, by executing this command you are actually authorizing SQL Server to force transactional recovery to run and skip the errors. If it faces errors, this operation scavenges as much out of the transaction log as it can and then rebuilds the transaction log from scratch. So taking this step is really the last resort you should try after every other attempts fails. After this operation is complete you will have your database back online. However, you’ll most likely have lost a bunch of data, broken constraints and inherent business logic in the database but at least you haven’t lost everything. You may want to involve your customers to run a sanity check on the data quality at this point. Possibility 4: If you find out that your data file is corrupted then most likely you have OS / Hardware level failure. For this these type of failure or anything really weird which you can not fixed easily with in acceptable amount of time, your best bet is restore from backup with out really wasting time in a “Code Red” situation. 2. Do not ever attempt to “detach” a database which is in Suspect. This will do nothing but you will probably loose your ability to repair it. 3. Read and understand the error log before taking any action and do not panic. Nothing in computer science is “unexplainable” so if you keep your calm and apply intelligence, you will come out of any situation with honor.